When you offer the ultimate oasis of family fun, ensuring that you keep your doors open at all times is essential to daily operations. For Magic Springs, that meant upgrading its five, power-hungry individual UPSs. The park wanted to consolidate its power protection solution with a centralized unit capable of protecting equipment well into the future. 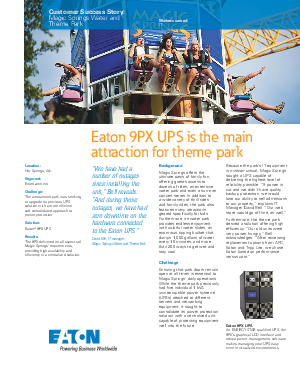 Their search led them to the Eaton® 9PX UPS. The 9PX delivered on every requirement, providing high availability and efficiency in a centralized solution. Magic Springs also gained up to 28 percent more wattage than comparable UPSs, with an exceptional power factor that positions them for future growth. Learn more about how the 9PX ensured a smooth ride for Magic Springs, while fitting their projected power needs for the next five years.